Portugal’s national music is Fado. Haunting yet beautiful, it’s a unique sound full of raw emotion that draws listeners into a captivating trance. Maria Ana Bobone is one of the best Fado singers in the country, known for her excellent voice and emotive performances. Following her appearance in our Portraits of Lisbon project, we spoke to Maria Ana about her love of Fado music and what makes the genre so special. How did the genre of Fado first come about? Historically, we first hear about Fado as a musical genre in the first quarter of the 19th century, referring to a sort of dance performed by people and slaves brought from Brazil with the Portuguese Court. Personally, I believe the roots are much older. When we read Camões’ Os Lusiadas, a poetic masterpiece about Portuguese history published in 1572 that describes the finding of the maritime route to India by Vasco da Gama, we can find the word Fado used to mean destiny or fate. To sing to your fate is also an idea presented in this epic poem. The genre has had many changes with time and came about as we know it today around 1930. Nevertheless, it continues to transform. How would you explain the sound of Fado music to someone who’s never heard it? I would explain Fado as a song of emotion, in which the feeling is the most important thing and has to be conveyed to the listener through an expressive performance. It is better if you understand the words, but not essential, as feelings are universal. Why do you enjoy performing Fado over other music genres? I enjoy performing other genres but Fado is a genuine form of music and, in my opinion, the one that best serves the Portuguese language. I am proud to know my traditions and represent them around the world. Which Fado houses do you recommend in Lisbon? I sing weekly in Clube de Fado, a Fado house where young and old singers perform and learn from each other. Fado houses are artistic meeting places where you can have a glimpse of the so-called Fado life. How did growing up in Portugal inspire you as a singer? My family inspired me as a singer. We were all very musical so it was a natural thing for me to sing and perform. Despite its small size, Portugal has a varied musical culture with a vast and beautiful traditional songbook that I learned from a very young age. The songs of northern Lisbon are happier and remind us of the Celtic culture that still survives there. In the centre you’ll find more Andalusian songs, while in the south, songs are melancholic with Arab influences, too. This musical map gives us a very rich palette to choose from. How do you think the Lisbon music scene has evolved in recent years? We have a very small market for music and culture but I’ve witnessed a huge growth in the interest for Fado and our own musical products. This is very positive and I hope we continue valuing our music. Fado is very exportable and has been an important vehicle for the promotion of the Portuguese musical culture around the world. What do you recommend for visitors travelling to Lisbon for the first time? I strongly recommend taking a cruise on the Tagus, walking along the riverbanks, taking trips to the São Jorge Castle and Jerónimos Monastery, and, of course, touring the Alfama neighbourhood with its Fado houses. What do you love most about living in Lisbon? The light is absolutely beautiful in Lisbon. From the closeness of the water to the ancestry of the city… I love living here. Where can visitors see you perform in Lisbon? 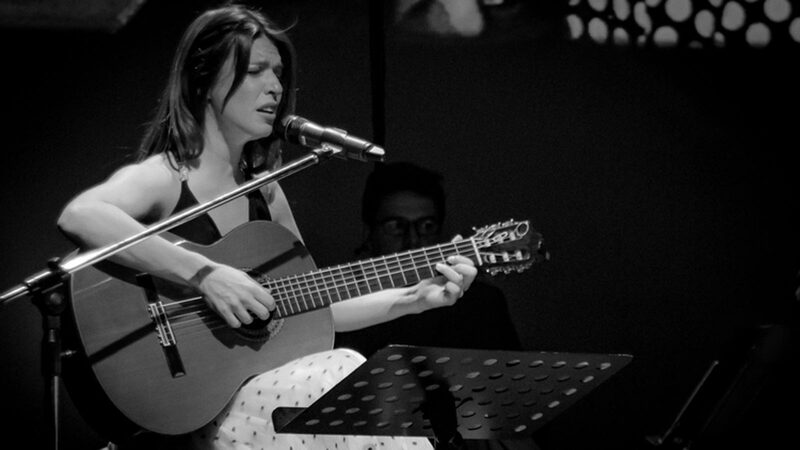 As well as weekly performances at Clube de Fado, I take part in concerts and festivals.